Town of Greece v. Galloway. The Becket Fund for Religious Liberty (n.d.). Retrieved from https://www.becketlaw.org/case/town-greece-v-galloway/. Town of Greece v. Galloway. (Apr. 04, 2019). https://www.becketlaw.org/case/town-greece-v-galloway/. "Town of Greece v. Galloway." The Becket Fund for Religious Liberty. Accessed [Apr. 04, 2019]. https://www.becketlaw.org/case/town-greece-v-galloway/. In the town of Greece, New York, volunteers from any religious faith may commence legislative meetings with a prayer. The town has had a wide variety of volunteers—from Catholics, Protestants, and Jews, to leaders from the Bahá’í and Wiccan traditions. This practice of legislative prayer can be traced back to the time of the Founding Fathers, who did not see it as a forbidden “establishment of religion” but rather as a powerful reminder of their own limited political authority and the divine source of the people’s inalienable rights. It is a practice as old as this nation, but thanks to a court decision, it soon became a forbidden practice. In August 2013, Becket filed a friend-of-the-court brief urging the U.S. Supreme Court to reverse a decision by the Second Court Circuit of Appeals and restore the Establishment Clause to its original, founding-era meaning. The brief explains that the Founders understood establishment of religion as consisting of four key elements: (1) government financial support of the church, (2) government control of the doctrine and personnel of the church, (3) government coercion of religious beliefs and practices, and (4) government assignment of important civil functions to the church – all linked by an underlying concern about state coercion to participate in religious activity. Because legislative prayer does not meet any of these conditions, it is not an establishment of religion. 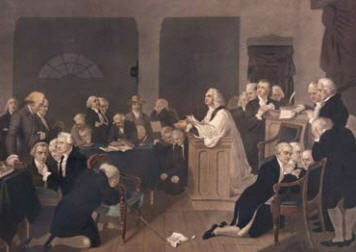 The brief also explains how the Founders “viewed legislative prayer as a natural outflow of their political philosophy of limited government and inalienable, God-given rights.” By hearing prayer before a government meeting, elected officials are reminded of the limits of their powers, as well as the source of the inalienable rights of those they are elected to serve. Oral arguments were heard in November 2013. In May 2014, the Supreme Court reversed the Second Circuit’s opinion, protecting legislative prayer in a great victory for religious freedom. For the first time in decades, the Court addressed the constitutionality of legislative prayer and helpfully began clarifying how lower courts should interpret the First Amendment’s Establishment Clause. Alliance Defending Freedom and Gibson, Dunn & Crutcher LLP were counsel in this case.